When it comes to projects requiring strength, toughness and thermal resistance, PETG is the material of choice. It’s very low warping behaviour makes it a real alternative to ABS! The True Berlin Color PETG filament extrudes odourless and readily achieves a smooth flow at temperatures ranging from 215º C to 250ºC, lending a glassy sheen to your transparent prints. 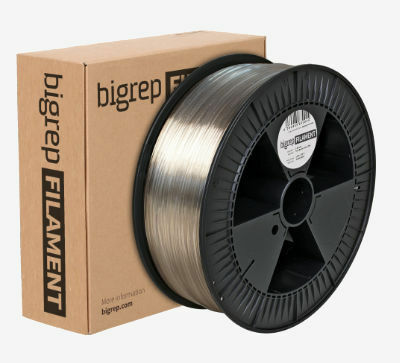 Fully compatible with all 3D printers that employ fused deposition modelling, our PETG filaments are also a natural fit for your BigRep device. PETG (Polyethylene terephthalate) is a thermoplastic material of the polyester family. PETG has excellent properties in terms of strength, toughness and temperature resistance, being an alternative polymer to PLA or ABS depending on requirements. The amorphous phases of PETG has a very impressive transparency. PETG is an excellent water and moisture barrier material and is widely used for soft-drink bottles. PETG can be also be used for 3D Printing, providing access to a wide range of transparent and lightweight materials. PETG is remarkably easy to use for 3D Printing (FFF/FDM) and it has an excellent first layer adhesion to the heated print bed. The optimum print temperature is obtained between 190 and 240°C and is dependent on the size of the printed object, PETG can be printed at a high printing speed. PETG filament has minimal shrinkage and warping effect in comparison to other polymers used for 3D Printing, and it’s also odourless. Some things need to be considered when storing PETG filament, filaments should remain sealed when being stored long term in order to prevent absorption of moisture from the air. High moisture content may harm the quality of the extrusion, leading to the clogging of the nozzles, as well as bubbles and spurting.